You have the ability to create multiple tax rates per state/province. Different tax rates can be configured based on state/province, zip code, and region. Please check regional tax laws for information about each area's specific tax requirements. Go to Settings Payment Tax Manager. Select the Country and State this tax rate will be applied to. In the Zip From and Zip To fields, you are able to enter a range of zip codes this tax rate will be applicable to. For example, you may enter 08002-08010. If these fields are left blank, the rate will apply to the entire region you have selected in the Country and State fields. Enter the Tax percentage in the Tax field. For example, if the tax rate is 6%, enter 6 in the box. Inc. Shipping: By default, tax rates are applied ONLY to the product being ordered. Checking this box will apply tax rates to the order's Shipping Costs as well as the order amount. Inc. Discount: By default, tax is applied to an order's main subtotal without accounting for any discounts that may be applied. For example, a $10 item is charged the same amount of tax as a $10 item with 30% off the item price. 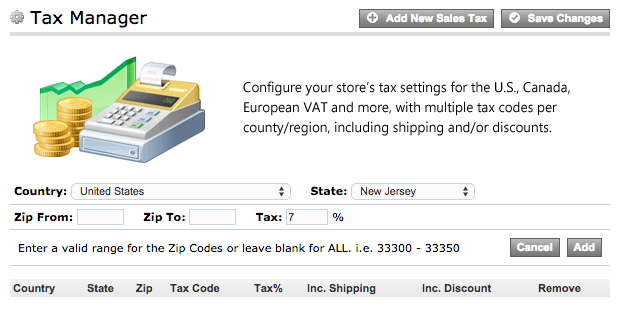 Checking this box will apply tax to the discounted amount of the order. Remove: Checking this box and clicking Save Changes will remove the tax setting. Once you have created tax rates, you may enter a Tax Code in the Tax Code field. This is useful if you are setting up different tax rates on a per product basis. For example, in some regions food items are taxed differently than material goods. In that case, you could create tax codes which can be applied to specific types of items. This is optional. 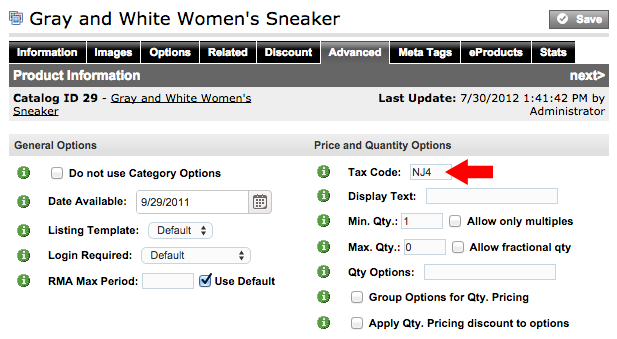 Tax codes are applied to individual items in the Advanced tab of the Product Information screen.